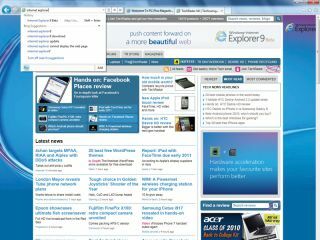 IE9 - acclaimed, but is it enough? Website analytics company StatCounter has insisted that Microsoft's Internet Explorer has been overtaken by Mozilla Firefox as Europe's most popular browser. StatCounter suggests that Firefox now holds a 38.11 per cent share of the browser market over Europe compared to Internet Explorer's 37.52 per cent. "This is the first time that IE has been dethroned from the number one spot in a major territory," said Aodhan Cullen, StatCounter's CEO. "This appears to be happening because Google's Chrome is stealing share from Internet Explorer while Firefox is mainly maintaining its existing share." Interestingly the company's December statistic also suggests that the UK – one of Microsoft's traditionally strong browser markets – could see Internet Explorer drop beneath a 50 per cent market share for the first time in years. Chrome is also the major beneficiary in the UK market – climbing by two per cent in December, with Google's browser having a real impact on the back of a major advertising campaign. Microsoft's latest browser, IE9, represents a major improvement from the company over its predecessors, but it remains to be seen if it can arrest a troubling decline in market share. On the bright side, IE is still hugely dominant in the US with a 48.92 per cent share, with nearest rival Firefox back on 26.7 per cent.